City officials are continuing to ask how to bring more life into Malden Square. One answer: Art. At a meeting last week between the recently organized arts community, the mayor's office, the Malden Redevelopment Authority and the City Council, gains were made to establish a community of artists downtown. The city is now looking into converting parts of buildings in the square, along Pleasant Street, to be used as work and living spaces for 10 to 20 artists, said Deborah A. Burke, marketing director at the mayor's office. The next step will be for the city to contact property owners to gauge an interest in converting the upper floors of buildings that house businesses into affordable condos and rental property, perhaps to be managed by the MRA. "One of the criticisms in redeveloping Malden Square is that it never really recovered after the growth of shopping malls," said Burke. "A lot of the space above first-floor retail space is vacant or underutilized. It would get some activity into those buildings and maybe draw some more business to the square." The question remains whether it will ever be a major retail center again, she said, after the effects of urban sprawl. Burke said officials want to see it become a place where people live, work and do their light shopping. "We want to still be Malden. It's not like we're looking to be Somerville," she said. "But we want it to be an inviting place, where people want to do some business or go out dining." Part of the meeting's purpose was to find out if Malden's artists community is as large as it was rumored to be, said Burke. She was pleasantly surprised to find the room in City Hall to be packed. 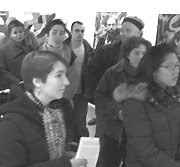 Nearly 50 artists gathered to relay their experiences of living and working in Somerville, Cambridge, South Boston's Fort Points area and the South End. They told how those spaces helped revitalize communities, until the market changed and artists were priced out of their homes. Lauren O'Neal was among three speakers Wednesday night who shared her experiences with community art projects. "The city appears to have done some good planning and strategizing around these issues," she said. "That's sort of a sign that they are real serious. Their urban revitalization plans included the arts from the get-go in their descriptions for what's going to be going on down there." Living and working in Boston is becoming a greater financial strain all the time, said O'neal. She is pleased with the amount of people who are backing the effort in Malden. "I would have been thrilled if there had been half that number," she said of Wednesday night's turnout. "Everyone there said they knew about five people who were also interested. Having worked in Somerville, Boston, Arlington and a number of places, it was nice to see that direct, unquestioning support. I was just really excited. I thought it was a great night, great discussion." O'neal used to live in Malden and is about to find herself unable to afford her Somerville studio. She would happily move back to Malden, she said, if the artist spaces were available. But Malden's downtown currently seems to shut down after 5 p.m., she said. "Malden's proximity, its diversity, and its mix of many different types of neighborhoods, community groups and a variety of wonderful new schools make it a dynamic place already," she said. "Increasing awareness of the arts and support for local artists will really add to the city's appeal for people in and outside of Malden." But unlike communities who have used artist spaces to revitalize, only to later out price the artists, Malden wants to have more of a long-term partnership with its artists community, said Burke. This could require condo deeds to have restrictions, so those properties would remain affordable for a period of time, and making multi-year rental agreements. Elise Mannella was another speaker Wednesday night who is active in arts and the community. She was there in the 1980s for the development of the Boston Center for the Arts and the gentrification of Boston's South End. "They have to be under somebody whose mission is to protect them," she said of artist spaces. Mannella's work space in Boston's Fort Point district was lost to luxury office space. Mayor Richard Howard would also like to see local artists give back to the community, said Burke, by keeping a regular presence in the city's public schools. That is just what Malden artist Sand T, who has been credited with organizing the city's artists, is hoping for. She hopes to have the opportunity to educate the city's youth and the public about art and its importance in a community. She has been gathering support for the downtown effort by holding art events in her garage for the past two years. The mayor and other town officials has been invited to many of them. Burke said she is pleasantly surprised at the collaborative effort. "Over the years it's been these small little groups. I was astounded by the turnout. There were newcomers, a lot of new faces. A lot of people who have been here for years, but kept to themselves."